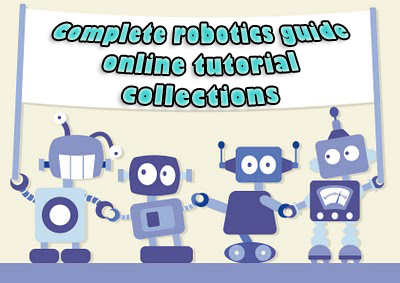 Learn robotics online: Complete robotics guide (from beginners to experts) ~ Engineering projects ideas for final year students & paper presentations collection blog. Robotics , Robotics and Robotics! Wow this is one common request we get from all most every reader of our blog. 4 out of 10 engineering students are found to be interested in this subject dealing with robots. Engineering students from all the majors including non electronics and non computer science too! This subject make wonder due to various reasons but the main reason might be the direct out come, the robots themselves! This robots seems to impress everyone right from a school going kid to a great PHD holder! May be we are feeling this love because of the dramas and movies we've seen in the past. Okay fine, What ever might be the background of this craze. We have tried to make a collection of good tutorials and materials for those crazy robot freaks. This is not he complete collection of the available materials, this will be constantly updated. All these are high quality links, bookmark this page for future use. 1. What is a Robot? "A reprogrammable, multifunctional manipulator designed to move material, parts, tools, or specialized devices through various programmed motions for the performance of a variety of tasks". "An automatic device that performs functions normally ascribed to humans or a machine in the form of a human." 9. Good Robotics project ideas and paper presentation? Instructables is one awesome site for all kinds of hobby projects. They also frequently update projects on robotics. Try this link if you want to try new and trending projects. These some good books recommended by us, for the beginners. You can search these books on the google books and amazon, to know more about the books. 12. Updates on the robotics study?